Costume includes a shirt and pants with gold ties on cuffs; hooded tunic with a gold dragon emblem; face mask headband; and a waist sash. Available in adult Men's sizes Medium, Large, and X-Large. Shoes and sword are not included. No one can mess up with a Ninja and you will surely don Ninja outfit for getting this unbeatable personality. If you are ready for a dare and you feel no fear from your enemies then Ninja costume is perfect for you. 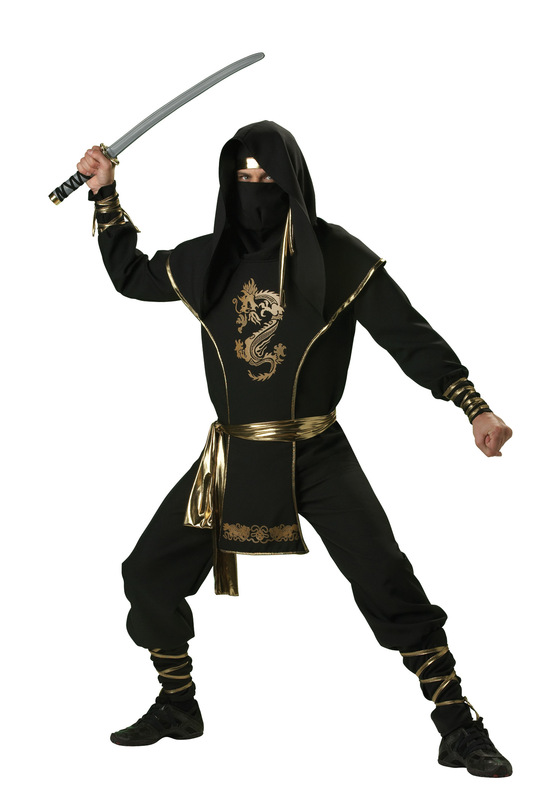 If you are planning to dress up like a deadly assassin then Ninja outfit is for you. You deserve to grab all the attention of ladies in your party. This will not give you goose bumps but you will get all attention in the party. You deserve to look totally cool and different in Ninja Warrior Elite Collection Adult costume. Care Instruction: Machine wash cold Gentle cycle, Tumble dry low, No bleach, Cool iron.